Charleston, W.V., residents are awaiting word as to when their water will be safe again after a chemical spill contaminated the Elk River. Federal authorities are also opening an investigation into the circumstances surrounding the leak of as many of 5,000 gallons of chemicals and what triggered it, U.S. Attorney Booth Goodwin said Friday. It followed a notice from the West Virginia American Water Company that its water supply had become contaminated, sending a strange licorice-like smell wafting through the surrounding streets. The West Virginia Department of Health and Human Resources told NBC affiliate WSAZ symptoms include: severe burning in throat, severe eye irritation, non-stop vomiting, trouble breathing or severe skin irritation such as skin blistering. Crews clean up a chemical spill along the Elk River in Charleston, W.Va., which compromised the public water supply of nine counties on Thursday. Once word got out about the governor's declaration, customers stripped store shelves in many areas of items such as bottled water, paper cups and bowls. As many as 50 customers had flooded a convenience store near the state Capitol in Charleston to purchase water. “It was chaos, that’s what it was,” cashier Danny Cardwell told The Associated Press. Residents were told not to drink the tap water, bathe in it or cook with the water and only use it for flushing and fire emergencies. Boiling it will not remove the chemicals. The odor from the spill — which has been likened to that of licorice or cough syrup — was especially pungent at the Charleston Marriott hotel just a stone’s throw from the Elk River, which runs into the Kanawha River in downtown Charleston. The Marriott shut off all water to rooms — but soon turned it back on so hotel guests could flush toilets. The hotel distributed 16.9-ounce bottles of spring water to each guest. Schools will be closed Friday in some of the affected counties. 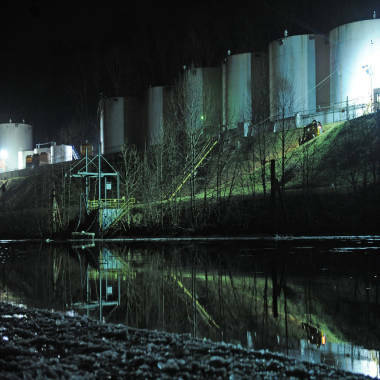 West Virginia American Water did not provide a timeline for the clean-up process, but the company's external affairs manager Laura Jordan told Reuters that the spill originated with Freedom Industries, a Charleston company. It occurred right above the intake of the Kanawha Valley water treatment plant in Charleston — the largest in West Virginia — and affects 100,000 homes and businesses, or 250,000 to 300,000 people, she said. NBC affiliate WSAZ said the leaked product is 4-methylcyclohexane methanol, which is used in the froth flotation process of coal washing and preparation. The chemical compound used to rinse coal. It’s a colorless liquid that smells like black licorice. Methylcyclohexane can be dangerous in high concentrations, but generally causes eye, skin and throat irritation, trouble breathing and dizziness or drowsiness if people are exposed, according to the Occupational Safety and Health Administration. It can cause pneumonia if it’s breathed deep into the lungs and nausea if it’s swallowed. The effects of prolonged exposure aren’t clear. Anyone who has symptoms after being exposed should rinse skin and eyes thoroughly, go to a well-ventilated area and seek medical care, safety documents indicated. Earlier, another West Virginia American Water spokesperson Jennifer Sayre urged residents not to panic and rush out to grocery stores to purchase bottled water, as local officials were working with the Federal Emergency Management Agency to open water distribution centers. Kanawha resident Mark Adkins told NBC News he thought local authorities gave the community plenty of time to prepare. “We got plenty of bottled water,” he said. NBC News' Daniel Arkin, Reuters and The Associated Press contributed to this report.